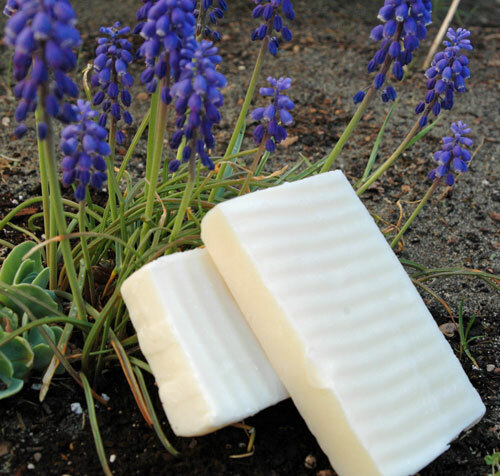 This episode of Happy Homesteading is all about making homemade soap! This one took a whole lot of research to figure out. I read and learned how they used to make it during the 1800’s. And then I talked to a local soap making artisan and asked her for some advice on best places to order products. This was by far one of the most interesting projects I have done thus far, and it was a lot easier than I thought it would be, although somewhat dangerous. 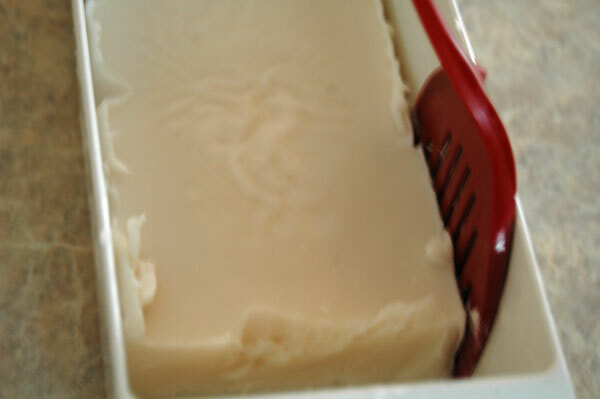 Soap made from scratch consists of 2 main ingredients. 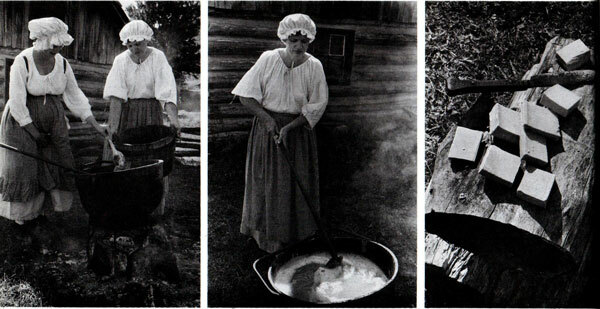 Animal fat (tallow or lard) and lye. They would make tallow by slow cooking beef fat for 3-4 hours on low, remove any cooked meat bits and strain it. Then let it cool and you have homemade tallow. I do plan on making some of this soon. Homemade lye is made from wood ashes. There is a process of basically using straw, pouring the ashes over the top in a barrel, then pouring water over them. After a few days the liquid is lye. I would love to try to make homemade lye myself too. I am just a little bit nervous though since I have kids around and this stuff can burn skin. But they usually had kids around too back in the olden days. If they can do it so can I. 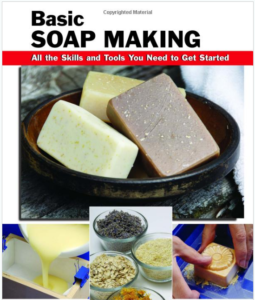 After talking to a local soap artisan about how to get started making soap, she recommended this kindle book called Basic Soap Making – you can download it on Amazon. At that time this ebook was FREE but now it’s up to $10.99. I downloaded it to my Android phone and read the whole thing in less than an hour. It’s a great book with LOTS of pictures to help you when you are getting started. I am a visual person so I love all the pictures. There are some recipes and ideas to make all kinds of interesting bars as well. Definitely worth reading if you want to make soap. I followed the directions to make the Basic 4 Oil Soap recipe in this book and I think it turned out really well. Just remember to follow the directions and safety protocols when using lye. It is a chemical and I read through a few horror stories while doing my research of kids grabbing the lye water mixture and burning themselves badly. Not worth that little bar of homemade soap for a blind kid..just keep that in mind. I decided to do my recipe when all the kids were gone to school for the day. 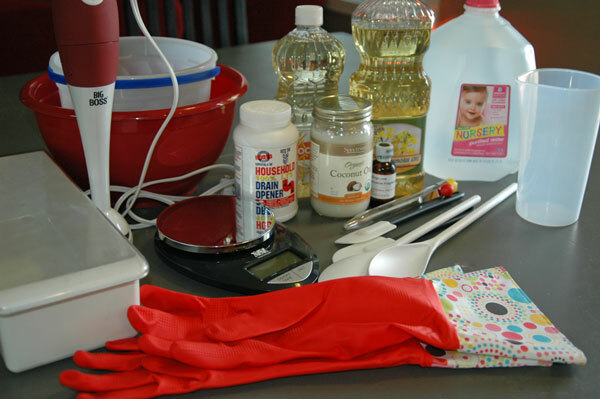 You need quite a lot of supplies to safely make homemade soap. I found a nice little strange egg container at a thrift store with a lid that I knew would be perfect shape for making soap, and it only costed me $3.00. 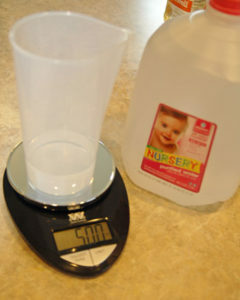 First thing I did was to tare the digital scale and measure out distilled water in a plastic dish. Next I measured the dry lye crystals in a plastic dish. 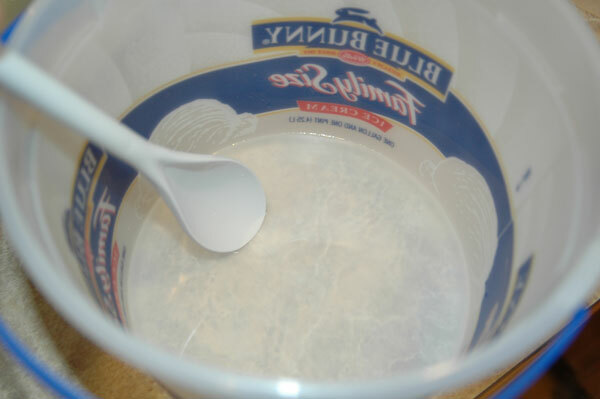 I then added the WATER first to an old plastic ice cream bucket. Then I slowly added in the lye crystals. Note: NEVER pour water into the lye, always add lye crystals to water. Oh and make sure you don’t splash. The lye and water got REALLY HOT, it was a chemical reaction. I noticed some steam and horrible smelling vapors, so I opened the window. I started stirring the lye & water mixture gently until the lye crystals were dissolved. Then I set it aside to cool (we want it to cool to around 100 degrees). Next was measuring out the oils. 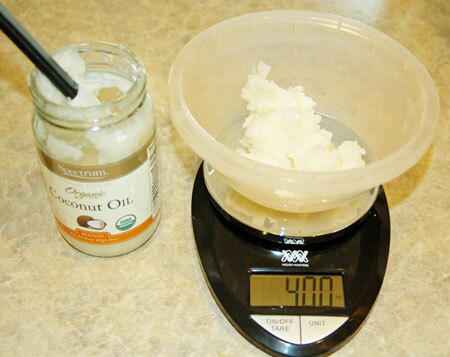 I placed a plastic bowl on the scale, tared it to say zero and started adding in the coconut oil. If I added to much I would take some away until it said 4 oz. Then I melted it in the microwave. I did this with all the other oils as well. Measuring them out with the scale. You have to be really exact with soap making. Next I gently mixed all the oils together into a bowl. Then once the lye solution cooled to 100 degrees I added in the lye/water mixture, being careful not to splash. I used my spatula to gently stir the mixtures together for a minute until it became slightly opaque. Then I took out my immersion blender and started blending being careful not to splash, and keeping the blades near the bottom of the mixture. I did this for around 2 minutes maybe…not really sure. And I didn’t have any of my photographers (aka kids) to take my pictures this time because I wanted to make this when they weren’t home. So no pictures of me using the immersion blender for now. When it started getting nice and thick I turned off the immersion blender and mixed by hand until it reached trace. Since this was my first time trying to reach TRACE I wan’t exactly sure what it was. 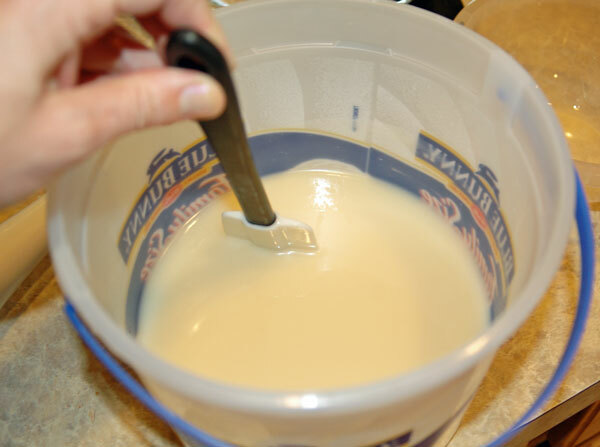 Its when the soap mixture is ready to pour into molds. 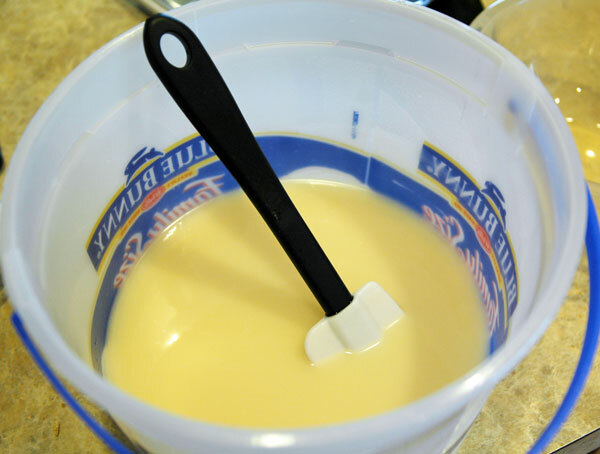 You can tell its reached trace when the soap mixture falls from your spatula leaving a trail of soap on the surface of the mixture for a few seconds before it disappears into the mixture. I then poured the mixture into my plastic mold. I didn’t add a freezer paper liner since my container is made of plastic and I heard that it would just pop right out when dry. I put the lid on, covered it up with two towels, let it rest to complete its saponification process for 24 hours. PS – you have to wait for 24 hours to clean all your tools too, so just leave your tools out to dry. After 24 hours my soap looked great! The only problem was that I should have used a freezer paper liner, because it did not want to just pop out of my plastic container. I had the worst time trying to get it out of the container and instead had to take it out in strange shards. I was really sad about it, hoping for beautiful square bars. Some I just rolled into a ball and cut into rounds. I then cut what I could using my pampered chef waffle cutter. Here are all the strange pieces I was able to get out of it. And lastly, you have to dry your soap for awhile. It’s best to cure it for about a month or even 6 weeks. The longer you air dry it the longer it will last when you use it. It’s been a month now and my bars of soap have dried. This recipe works really well, it lathers great and has no fragrance. It’s a really nice clean soap. I rather enjoyed making soap for the first time, and will be making more for the fun of it. WORTH THE COST FOR THIS RECIPE? NO – if you are an Ivory soap user. 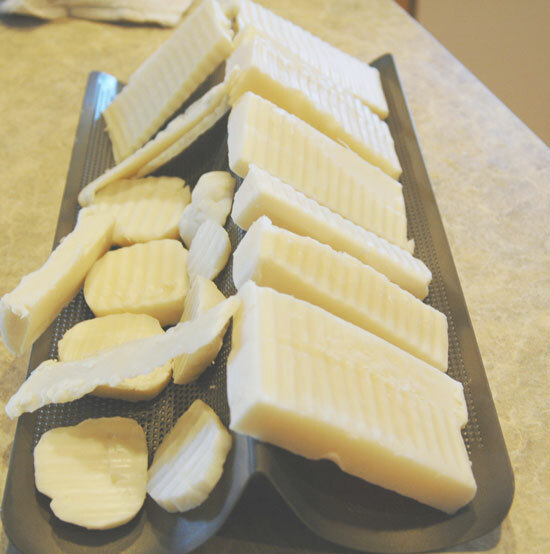 Ivory soap cost’s less to buy at Walmart than making it yourself. 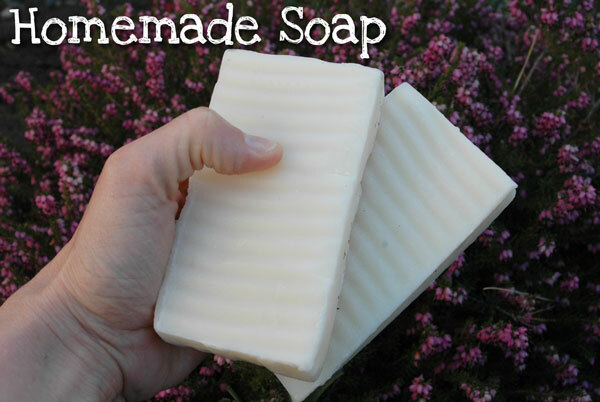 But if you like the more artisan or fancy brands of soap than this recipe is more cost effective. Later on I will be making a tallow/homemade lye recipe and will be doing a cost comparison on that one which I think will be more cost effective – stay tuned. WORTH THE TIME? NO, but it was fun to make! Making homemade soap takes time, there is risk involved when working with lye, and then you have to let it cure for a month or longer. So buying the store bought Ivory soap is a quick affordable easier option. But I still had a blast making it…and will be making more for fun. 4 ounces coconut oil (solid) ($4.99/14 oz) = $2.85 for 8 oz. 3 ounces canola oil ($2.24/48 oz.) = $0.28 for 6 oz. 4 ounces olive oil ($2.99/16 oz.) = $1.50 for 8 oz. 4 ounces safflower oil ($3.98/32 oz) = $1.00 for 8oz. 5 ounces distilled water ($1.00/gal) = $0.07 for 10 oz. Final cost: $6.69/ 2.2 lbs. 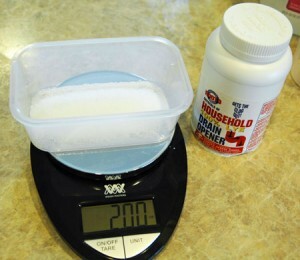 2.2 lbs of soap = 35.2 oz. Lets compare this homemade soap recipe to a 6 pack of Dove soap which costs $6.88 for a 6 pack at Walmart. Each bar is 4 oz. To get 32 oz. like in my homemade recipe it would cost around $9.17 worth of Dove soap. Ivory soap is one of the least expensive brand of bar soap, so I wanted to compare them as well. 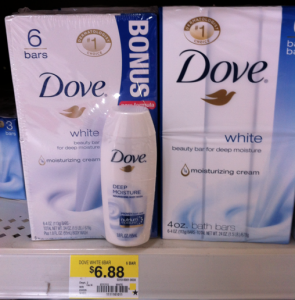 A 3-pack of Ivory soap is $1.27 at Walmart. To get 32 oz. like in my homemade recipe it would cost around $6.45 for 32 oz. 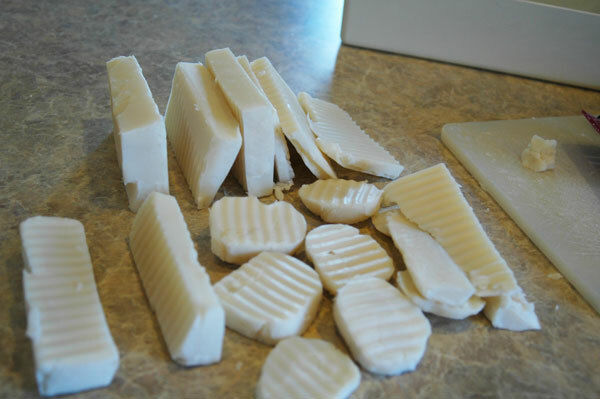 Ivory soap is a teeny bit less expensive than making soap yourself at home. Final thoughts on making my own Homemade soap. I like that I know all the ingredients that went into making my own soap, and it was a really fun project! But it was a little bit stressful and dangerous. I could have burned myself with lye, so there is risk involved. I like that I learned how to make it and am really excited to try other recipes too. I think science is fun! 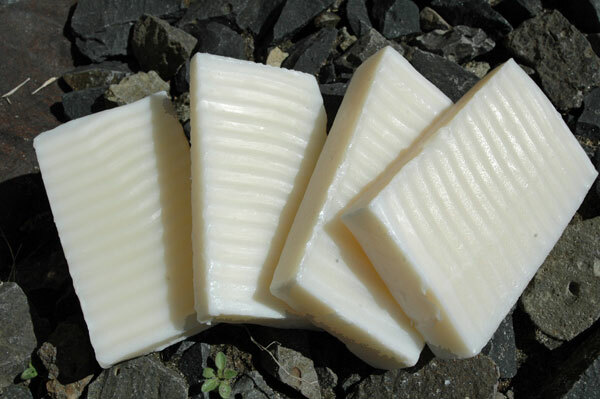 Stay tuned for me making homemade soap with homemade tallow and homemade lye in the future. 🙂 I’m guessing this will be even more cost effective, but who knows! I love making my own products too! It’s not just about saving money for me, it’s about quality. Great post. I use a quart canning jar to mix the water and lye. I measure the water (6 oz.) into the jar, measure the lye, take them outside, pour the lye into the jar and, holding onto the jar threads and to top, swirl the solution around until the lye has dissolved. Then, I leave the jar outside in the back yard to cool. Kids and pet stay at the other end of the house until I give the all clear.